How do we continue this streak of paired up related posts? Well, the past two day's photos have featured a fountain. Today's photo doesn't actually show a fountain itself, but it's located where a fountain occurs. Crossing over the Promenade into Disney California Adventure, we find ourselves in Carthay Circle, which is anchored by its own lovely art deco fountain, as we gaze up at the blooming trees and catch sight of the sumptuous Carthay Circle Restaurant. Though the blooms aren't as thick as at The Hub in Disneyland, their mix of pink and green leaves gives a lovely balance of color, and the deep blues of the sky in the background and the warm white of the Carthay Circle Restaurant building add a vivid depth to the scene. It's such a gorgeous time of year, isn't it? 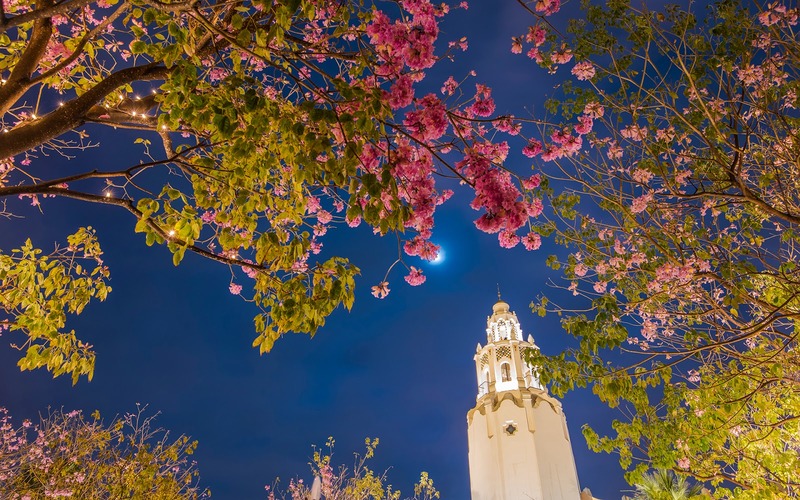 The moon peeks behind a tabebuia blossom over Carthay Circle.